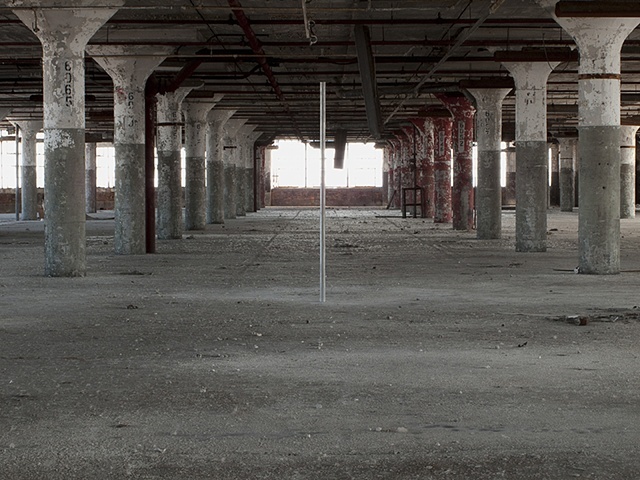 This piece was installed in the Russell Industrial Center; an old manufacturing facility in Detroit Michigan formally known as the Murray Manufacturing Company. The 2.2 million square foot building stamped automobile parts for Ford, Mercury, Packard, Plymouth, Chrysler, International-Harvester Hudson Jet, and Aero Willys until the early 50's when it ceased production. Now mostly vacant and condemned the building houses 1/4 its capacity with small businesses, and artist studios. The installation of an extruded metal pipe, 7ft in length, falls from its upright position crashing to the floor. The piercing echo brings the once prosperous industrial facility's emptiness to attention ringing in hollowness. The metal pipe lifts itself back to the vertical position dropping again and again.